The Medela Swing Maxi Breast Pump comes with two swing features and a two phase expression technology with high end pumping pattern. This tends to mimic a new-born's nursing rhythm. There are two working modes for this breast pump, the expression mode and the stimulation mode. These modes make for an effortless, painless and easy pumping method. This Breast Pump the touch downs buttons lets you pump immediately which allows faster milk flow. The massaging Soft Fit breast shield provides enough comfort and the convenient size lets you place it on the table, counter or attach it to the belt clip. The adjustable vacuum and speed also allows you for customised pumping. Pumps 18% more milk in half the time with simultaneous expression and 2-Phase Expression Technology. A range of 9 vacuum levels and settings for additional comfort and personalisation. Intuitive, easy to assemble, use and clean. Light and compact, with battery option making it easy to pump at home or on the go. Explore the entire range of Breast Pumps available on Nykaa. 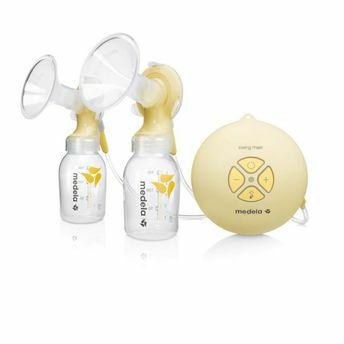 Shop more Medela products here.You can browse through the complete world of Medela Breast Pumps .